+The number of Aeroplan Miles required for the destination is accurate as of February 7, 2019 of communication and is subject to change at any time by Aeroplan Inc. According to Aeroplan's current reward chart, destinations reflect a roundtrip Fixed Mileage Flight Reward® in Economy Class departing from within Canada or the continental US (plus applicable fees and taxes). Fixed Mileage Flight Reward availability is capacity controlled and is subject to availability at time of booking as well as seasonality of demand. Aeroplan Flight Rewards are subject to taxes, landing and departure fees, and other charges and surcharges may apply. Aeroplan Partners rules and regulations are subject to change without notice. For full details on Aeroplan's current reward chart, please visit aeroplan.com. 4 1.5 Bonus Aeroplan Miles (“Bonus Rate") are earned on each $1.00 in Purchases of eligible gas, groceries, drugstore, and aircanada.com products and services (excluding Air Canada Vacations packages, car rentals, hotel bookings, and other third party partner products and services that can be purchased through aircanada.com) charged to your TD Aeroplan Visa Infinite Card Account (“Account”). Any returned items, refunds, rebates or other similar credits will reduce or cancel the Aeroplan Miles earned on the original Purchase. To earn this Bonus Rate, Purchases of gas, groceries, drugstore and aircanada.com products and services must be made at merchants classified through the Visa network with a Merchant Category Code (“MCC”) that identifies them in the "gas", "grocery" or "drugstore" category and on aircanada.com. Some merchants may sell gas, groceries or drugstore products/services, or have separate merchants located on their premises that also sell gas, groceries or drugstore products/services, but may not be classified with a gas, grocery or drugstore MCC and such Purchases will not earn this Bonus Rate. If you have questions about the MCC that applies to a Purchase, contact TD at 1-800-983-8472. Bonus Rate is only available on the first $80,000 in net annual Purchases of gas, groceries, drugstore products/services and on aircanada.com made from January 1 to December 31 each year on your Account. Once the maximum net annual amount has been reached, Purchases of gas, groceries or drugstore products/services on the Account will not earn the Bonus Rate but will only earn Aeroplan Miles at the standard rate that applies to all other Purchases on the Account. This Bonus Rate offer is in place of and not in addition to the standard rate earned on all other Purchases made on your Account. Offer may be changed, withdrawn or extended at any time and cannot be combined with any other offer. 6This feature is available at over 150 Aeroplan Partner brands and 100 online retailers through Aeroplan’s eStore. 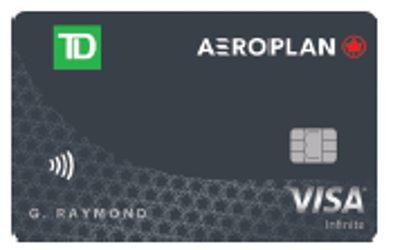 The Toronto-Dominion Bank is not responsible for any Aeroplan Miles under this “earn miles twice” feature of the Aeroplan Program when the Aeroplan Membership Card is presented. See your Aeroplan Program for full details. Feature may be changed, withdrawn or extended at any time and cannot be combined with any other offer. ®Air Canada, Air Canada Express, Air Canada Rouge and the Air Canada Maple Leaf logo are registered trademarks of Air Canada, used under license. ®Air Canada is a registered trademark of Air Canada, used under license. ®Fixed Mileage Flight Rewards and Market Fare Flight Rewards are registered trademarks of Aimia Canada Inc.
®The Aeroplan logo and Aeroplan, are registered trademarks of Aimia Canada Inc.